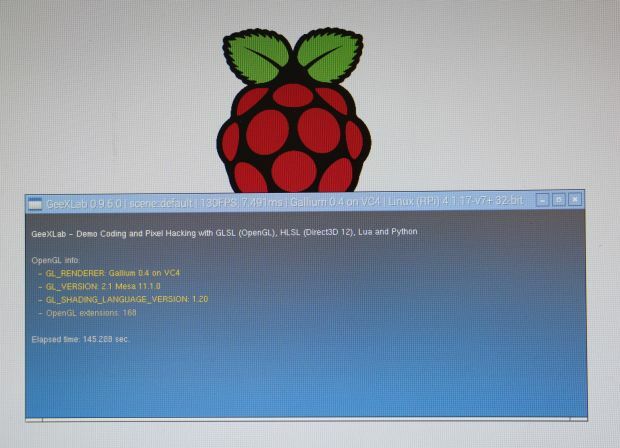 GeeXLab 0.9.6.0 comes with a new support: Raspberry Pi with OpenGL desktop (OpenGL 2.1). This OpenGL support has been added in the freshly released Raspbian Jessie Feb 2016. 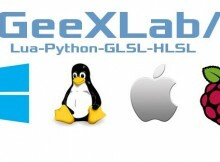 For the Raspberry Pi platform (Raspbian), GeeXLab is now available in two flavors: OpenGL ES 2.0 and OpenGL 2.1. I planned to add the same kind of live-coding to the GLSL shaders in the future. On Mac OS X, the log file is now generated in GeeXLab folder like on the other platforms, and no longer in the user’s home folder. You can download your version of GeeXLab as well as the Code Sample Pack from THIS PAGE. The code sample pack will be re-organized soon with separate folders for OpenGL 2.1, OpenGL 3, OpenGL 4, OpenGL ES and Direct3D 12 demos. + [RPi] added support of OpenGL for desktop. + [OSX] the log file is now created in GeeXLab folder. (FRAME script) just by saving the file. + added is_rpi() to gh_utils (lua / python). + added hex_color_to_rgb() to gh_utils (lua / python). get_texel_2d_v2() to gh_texture lib (lua / python). to gh_renderer (lua / python). separate files (filename_vs, filename_ps, ...). Add a seperate folder for Vulkan in your code sample pack too please. Please Unify GeeXLab to provide the two flavors.